PCA9548A and TCA9548A? The SparkX version of the Qwiic Mux breakout used the PCA9548A. The SparkFun red version uses the TCA9548A. Overall, both should be functionally the same with a few minor differences. The Qwiic Mux - TCA9548A enables communication with multiple I2C devices that have the same address. 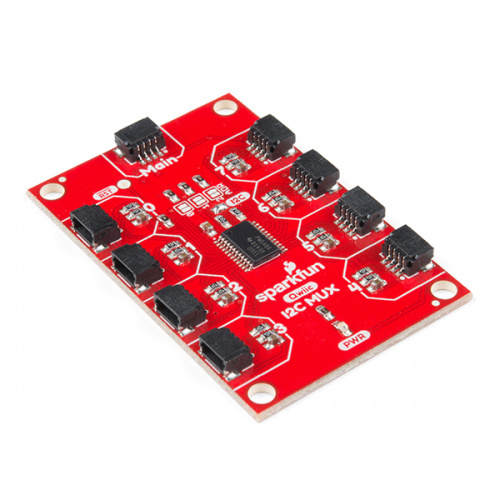 The IC is simple to interface with and also has 8 configurable addresses of its own, this allows you to put 64 I2C buses on a single bus! 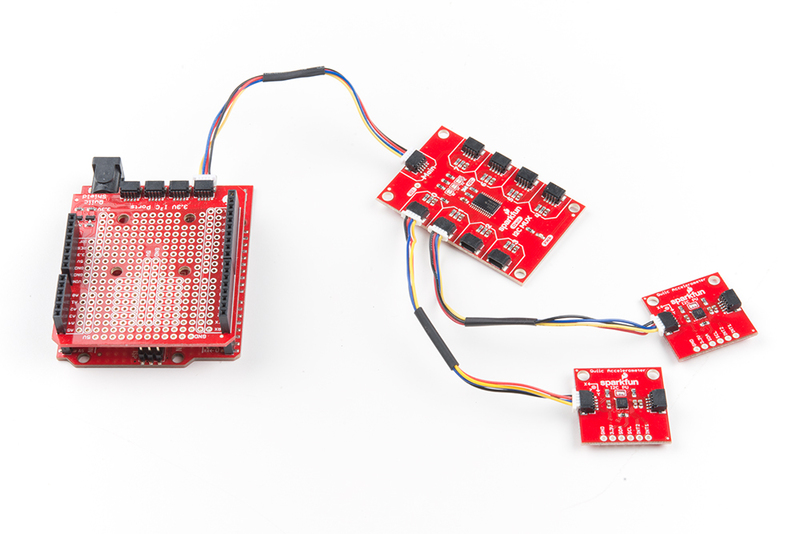 In this tutorial we'll go over how to talk to sensors on different channels of your MUX. The application of this is pretty straightforward so things won't get too fancy. You will also need a Qwiic cable to connect the shield to your MUX, choose a length that suits your needs. Let's look over a few characteristics of the TCA9548A so we know a bit more about how it behaves. The Qwiic input for the Mux is located at the top-center of the board, labeled Main, highlighted in the image below. The outputs are then located on the left and right sides of the board and are numbered accordingly. The onboard reset pin, highlighted below, is an active low input. Pulling reset low for at least 6 ns will restart the multiplexer. The Qwiic Mux also allows you to change the last 3 bits of the address byte, allowing for 8 jumper selectable addresses if you happen to need to put more than one Mux on the same I2C port. The address can be changed by adding solder to any of the three ADR jumpers, shown in the image below. The below table shows which jumpers must be soldered together to change to the corresponding address. If you want to remove the pullup resistors from the I2C bus, simply remove the solder from the jumper highlighted in the below image. With the shield assembled, SparkFun's new Qwiic environment means that connecting the mux could not be easier. Just plug one end of the Qwiic cable into the Qwiic multiplexer breakout, the other into the Qwiic Shield of your choice and you'll be ready to upload a sketch and figure out just how all those address sharing sensors are behaving. It seems like it's too easy to use, but that's why we made it that way! SparkFun has written some example code to enable and disable ports on the Qwiic Mux. Go ahead and download this example code here. Warning! Make sure to have the Mux_Control.ino in the same folder when compiling the Example1-BasicReadings.ino sketch file. Otherwise, you may have issues uploading code. Opening Example1-BasicReadings will open two tabs in the Arduino IDE, the first example, and also Mux_Control. Let's take a look under the hood of Mux_Control to get an idea of what's going on. There are two functions here, boolean enableMuxPort(byte portNumber) and boolean disableMuxPort(byte portNumber) which is pretty much all we need to specify which channels we'd like to talk to on the Mux. 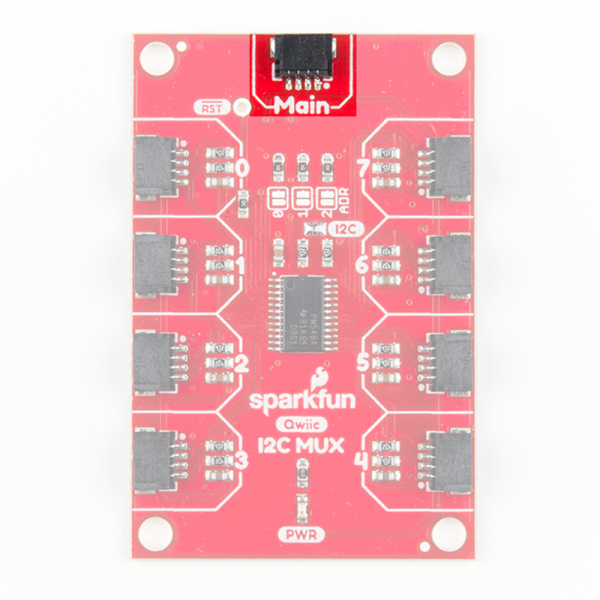 If we have a sensor on channel 0, we simply call enableMuxPort(0) to open that channel on the multiplexer. Then we'll take whatever reads and perform whatever actions we'd like to the sensor on that channel. Once finished, we have to call disableMuxPort(0) to close communication on that channel so we don't accidentally perform actions on the sensor on that channel. The below example code shows how to read from two MMA8452Q accelerometers. With the example provided, you should be able to read two I2C sensors with the same address on the same bus! Try opening up the Arduino Serial Monitor set to 9600 baud in order to read the sensor values. 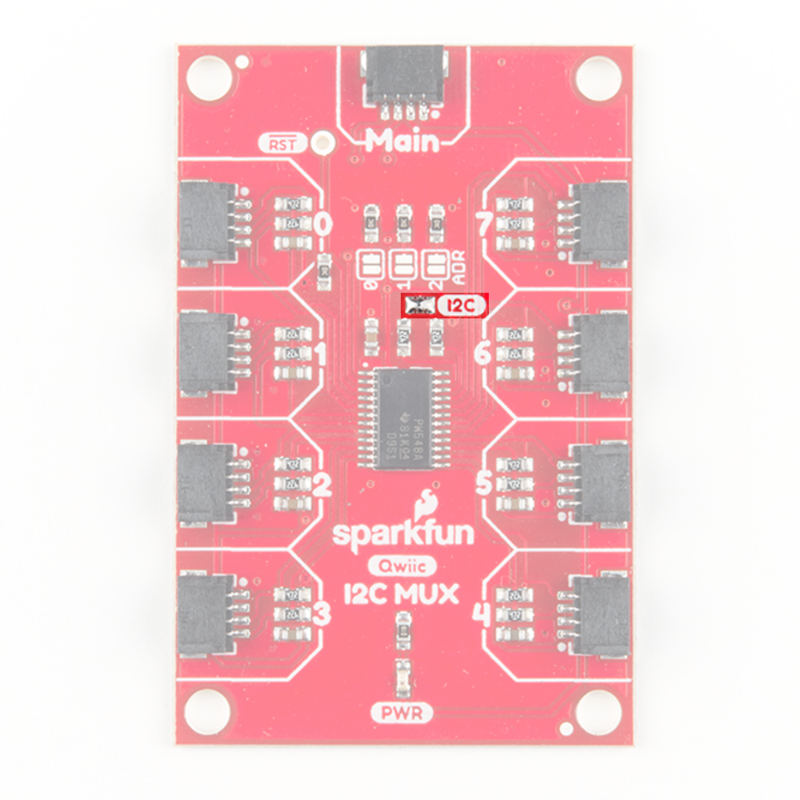 Now that you've successfully got your Qwiic mux listening to all of those concurrent addresses, it's time to incorporate it into your own project!